PLEASE NOTE: Once your order has been processed, this product is non-returnable. When you place your order you will receive instructions on how to download your software and will then need to verify your eligibility with us. After your eligibility is processed you will receive an email with a software Activation Key. Create, edit, and manage screenplays on your Mac. Import and export Final Draft scripts. Use the custom, pre-formatted templates. Montage guides the first time screenwriter or the seasoned veteran, from start to finish. Screenwriting is a creative process but it’s not a free-for-all. It requires a specific type of formatting – from typestyle to line spacing and indentations. You can have a blockbuster idea but without the proper screenwriting format, it won’t get read. 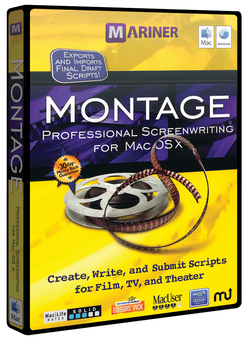 Montage, a screenwriting product developed exclusively for the Mac, contains everything you’ll need to create the right format so that your script won’t be another addition to the circular file. Montage is designed to automatically structure your writing - you don’t have to worry about learning a complicated process. They've even included templates for almost every genre: TV, film, theatre, musical, comic book and more – just take your pick and Montage will do the rest. Looking at your work from different perspectives, like any other type of art, is a good thing. Montage provides multiple views such as the Script View, so you can see what you’re writing page by page. The Outline View lays out your script scene by scene and allows you to organize your script and even set its status.